at Mackinaw City, Michigan in July of 1955. See CENTURY OLD PHOTOS AND A MODERN PENNANT. RINGLING BROS. at Detroit, Michigan IN 1934. An excerpt from the book HOSPITALoffers a behind the scenes view of Ringling's 1934 OUTBREAK OF TYPHOID FEVER. You can read here about MY ONLY CONNECTION WITH RINGLING. Here's a clip which shows KELLY-MILLER CIRCUS SIDEWALLIN' AT WESTLAND. Click on TRUE CIRCUS WORK HORSES the chain drive Mack Trucks. To view a rare photo of THE GREAT WALLENDAS performing soon after their disastrous Detroit accident in 1962 and to see the AL G. KELLY AND MILLER BROS. SHOW in 1953 CLICK HERE. FISHER BROS. CIRCUS came to Mackinaw City, Michigan in the Bicentennial year of 1976. See views of America's LAST REAL CIRCUS PARADE. Here are a number of 1944 and 1946 photos snapped in Pontiac, Michigan showing COLE BROS. CIRCUS, one of the last of the big railroad shows. Both Florida and Michigan pix of Ringling's upscale but somewhat short-lived tent show, BARNUM'S KALEIDOSCAPE, appear on these pages. CIRCUS FLORA as seen in Scottsdale, Arizona. View a color photo and read about the Showmen's League of America's ELEPHANT STATUE MEMORIAL which is located in Chicago's Woodlawn Cemetery. Among those buried here are 56 casualties of the 1918 Hagenbeck-Wallace train wreck. See EIGHT pages of color pix and text regarding THE CARSON & BARNES CIRCUS setting up at Milford, Michigan on August 18, 1998. View a 1983 FORD BROS. CIRCUS POSTER. Here are three pages of OLD CIRCUS POSTERS. 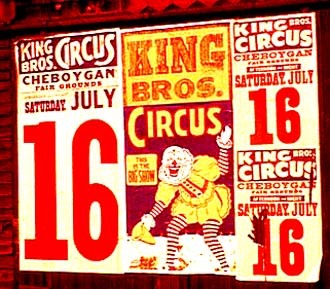 The GEORGE W. COLE CIRCUS played Mackinaw City, Michigan during 1957. BARNES & DAILY showed in Mackinaw City on Labor Day, 1974. Visit the CLYDE BEATTY CIRCUS in 1962. Many interesting Circus Web Sites may be reached by clicking on MY LINKS PAGE. Your Webmaster is Hartland Smith. Click on my name if you wish to contact me by e-mail. GREAT AMERICAN CIRCUSES is © 1997--2016 by Hartland B. Smith. All rights are reserved. Duplication of any material from this site may be made only upon written permission from the webmaster.